Heat large skillet to medium-high heat. Add sausage and cook, breaking up with a wooden spoon, until browned, about 5-7 minutes. Stir in flour and cook for about a minute. Whisk in low fat milk and bring to a simmer until thickened, about 4-6 minutes, stirring regularly. Season with salt and pepper to taste and stir in crushed red pepper flakes, if desired. Heat a waffle iron to medium-high heat. Coat generously with cooking spray. In a large mixing bowl, thoroughly combine hash browns, eggs, cheese, salt, pepper and garlic powder. Fill waffle iron with a layer of the hash brown mixture and close the lid. Cook 4-5 minutes, until hash brown is browned and crispy. Remove waffle with forks, then repeat the process with remaining hash brown mixture. 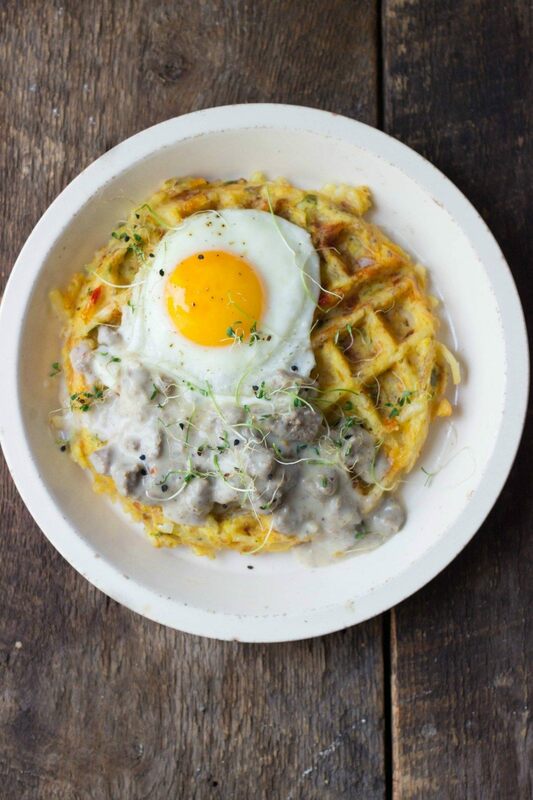 Top waffles with fried eggs, turkey sausage gravy and greens.